Howdy and welcome to Flawed yet Functional! I am Emily Stauch, an AVM survivor and Type 1 Diabetic. This space is used to share my story, health findings, and recipes to encourage you to take the next step in your health journey. I was a skeptic at first, but I’ve found HUGE health improvements since changing what I eat (Insulin free for 19 months!). “You are what you eat” has so much more meaning for me now! To that end, I share recipes I’ve created for my family and me here on the blog. 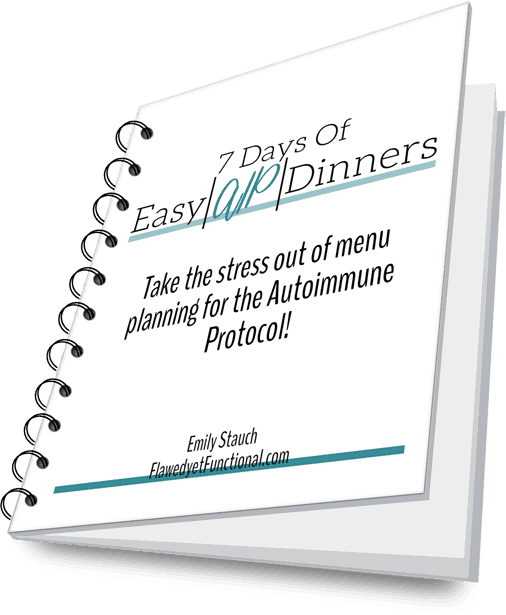 My diet is the Autoimmune Protocol plus a few reintroductions, close to Paleo but not quite! My latest recipe is Dairy-Free Paleo Chicken Salad. While similar to Chicken Broccoli Salad, in this recipe I only use pantry items. Check it out! Chicken salad is my husband’s favorite lunch, hands-down. When we eliminated dairy from our diet, I didn’t even consider dairy-alternatives for the longest time. Slowly, I became acquainted with all the dairy-free but dairy-like options: dairy-free milk, dairy-free yogurt, even dairy-free cream cheese! Dairy-free yogurt made my diet feel so much more normal! Yogurt with fruit on top used to be a staple in our lunch table, and now we can enjoy it again! There are several dairy-free yogurt options available at my supermarket. Let me give you a quick run-down of the ones I’ve tried so you have a little info in case you’ve never bought it. Let’s start with my favorite! This almond milk is my go-to choice because it doesn’t have any grain additives (some have rice), and it comes in 24oz containers. I buy the “plain” version on the regular to use in cooking, eating plain, topping with fruit, or adding to smoothies. My only con for this yogurt is every flavor is sweetened, even “plain.” For the sake of my diabetes, I wish they had an unsweetened version with fewer carbs. (at least not in my stores!) . I use this one as a treat for my kids if they are being good in the grocery store or if we are going on a trip to the zoo. Picking out their own flavor is super fun for them! It’s truly the little things in life that bring the most joy! Ok, I so wish the stores around me carried this one in plain and a large container. Their website shows it’s available, but I haven’t found it near me. Hands down, this is the best tasting dairy-free yogurt. It’s thick, creamy and just downright delicious. Cons: it is the most expensive and only comes in individual servings (around me, that is). I will be on the lookout for this brand to make other options available near me because it rocks! You have to try it! Ok, back to the recipe. I like chicken salad to come together quickly. Yes, I still use fresh onions and celery (you can’t beat that crunch and flavor! ), but other than a quick chop of those, I like to just dump the other ingredients in a bowl, stir, and serve! For that reason, I opted to use only dried spices and raisins instead of fresh grapes. Fresh grapes are so delicious in chicken salad, but they take forever to halve and my kids usually inhale them as soon as I bring them home from the store! So I used raisins instead. Be a little stingy about how many you add, they are much sweeter than a grape and quickly overpower the dish. For the chicken, I plan to make Dairy-Free Paleo Chicken Salad the day after we have chicken the night prior. Lemon Garlic Herb Roasted Chicken or Quick Skillet Chicken Thighs are excellent recipes to use the leftovers in this cold chicken salad! Lastly, I have to share the one dried spice I think is make-or-break for a yogurt based salad: celery seed. To me, chicken salad is just missing something without a shake of celery seed. I guess maybe this isn’t a pastry staple to everyone, so you might have to purchase this ingredient. Once you try it in chicken salad (or egg salad if eggs are in your diet! ), you will never make a yogurt-based salad without it again! That wraps up all my tips and tricks for this delicious Dairy-Free Paleo Chicken Salad! Besides a little chopping of the onions, celery, and chicken, this recipe is all about tossing the ingredients in a bowl to mix up and serve quickly. Serve with Simple Mills Sea Salt crackers or greens, fresh veggies, and fruit for a quick lunch or dinner. Enjoy! Check out this easy, Paleo chicken salad recipe that will use up your leftover chicken and please all the palates in your home! This cold, chicken salad comes together quickly with a few aromatics and dried spices! Chop celery, onion, chicken, and pecans and put in medium sized mixing bowl. Add raisins, yogurt, and spices. Stir to completely coat. If it looks dry, add more yogurt, one tablespoon at a time. Taste and adjust seasoning as necessary. Serve with Simple Mills Sea Salt crackers, fresh veggies, and fruit for a quick lunch or dinner! Want to remember this? Post this Dairy-Free Paleo Chicken Salad Recipe to your favorite Pinterest board!